The Emerging Infectious Diseases (EID) journal – flagship journal of the Centers for Disease Prevention and Control (CDC) – has just published online a letter describing the outbreak of multidrug-resistant tuberculosis (MDR-TB) among patrons of several LAN gaming centers in Singapore in 2012 (COI: I was involved at the laboratory end of investigations and am an author on this letter). Some may remember this outbreak from 2012, which was reported in the Straits Times (below) and even Bertha Henson saw fit to comment about it on her blog. 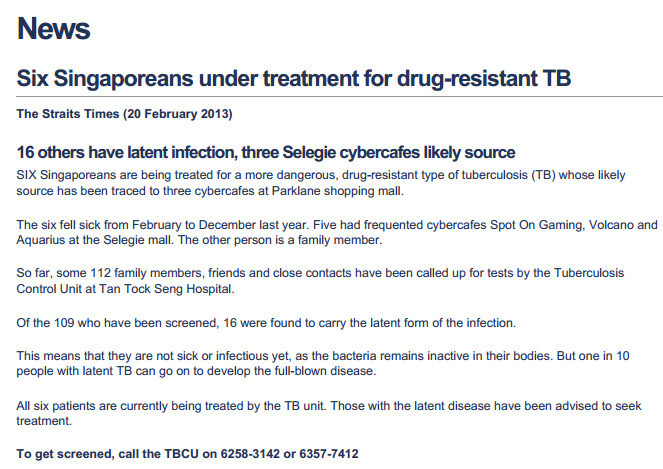 Straits Times report on the MDR-TB cybercafe outbreak published Feb 2013. What’s interesting in the EID letter is the combination of both “shoe-leather” epidemiology and fairly high-tech molecular work to try to piece together the sequence of transmission in the outbreak. There were five patients with active tuberculosis at the time the outbreak was reported – all young men who had spent many hours playing and working at the LAN gaming centres. The first four (A-D) had frequented Aquarius Cybercafe up until it closed in November 2011, and patients A and B had already been coughing for at least a month before the closure. Patients B-D then shifted their activities to the second LAN gaming centre, where patient E frequented. Each of these five patients were variously diagnosed with MDR-TB between February 2012 (A) and November 2012 (E). Time course of the MDR-TB outbreak involving the first five patients that had frequented the LAN gaming centres. One of the most difficult parts of the investigation involved tracking down the LAN gaming centre patrons that might potentially have been exposed to these cases. As one might have expected, the management of these centres were not particularly inclined to be helpful (until the MOH intervened) – and perhaps they were unlikely to know the majority of their patrons in any case. Publicising the outbreak in the press was one way to try to get potential contacts to step forward to be tested. Ultimately, besides these five cases, there were more than a dozen who also tested positive for tuberculosis, but were latent cases as there were no signs or features of active tuberculosis infection. These probably continue to be followed-up at the TB Control Unit to this day. The use of molecular profiling on the MDR-TB bacteria isolates generated molecular “fingerprints” that could then be compared to all other TB isolates in Singapore that had been similarly profiled. Similar to a criminal fingerprint database – but for bugs! The TB Control Unit had collaborated with the Central Tuberculosis Laboratory at SGH to set up such a database since 2005, funded initially by a project grant from the National Medical Research Council, but now this is part of the operational funding for TB control in Singapore. For this particular outbreak, the molecular fingerprints of these five isolates were identical to each other, and also to another MDR-TB isolate from 2008. This last isolate was obtained from a karaoke lounge hostess who was diagnosed with tuberculosis in Singapore in 2008, but left the country before treatment was initiated. Now, because the tests used for initial molecular profiling are not particularly specific (i.e isolates classified as being “identical” may not actually be related to each other), the additional “high-tech” step performed was to sequence the genomes of all the six isolates and then compare them to each other. This was performed courtesy of the A*STAR strategic program POLARIS, with the subsequent analysis performed by researchers from the Saw Swee Hock School of Public Health. And what the whole-genome sequencing (WGS) showed was that all the five isolates from cybercafe patrons (A-E) were exactly identical, whereas the 2008 MDR-TB isolate from the karaoke hostess was so close (only 3 single nucleotide polymorphisms apart) to the above five isolates that it was virtually certain that they were related. On further questioning, it was uncovered that patient A had worked at the same karaoke lounge during the same time that the hostess had worked there, although he did not remember ever coming into contact with her. It seems highly probable that the karaoke hostess had transmitted her MDR-TB isolate to A, who had then infected B-D, and E was likely infected by either B or D.
A cautionary tale on how easy infectious agents such as tuberculosis can spread in Singapore. MDR-TB – the subject of a future post – is now a major problem in many countries, including parts of Eastern Europe, India and China. Unlike “ordinary” drug-sensitive TB, treatment of MDR-TB requires drugs that are far more toxic and/or expensive, treatment for at least a year (as compared to drug-sensitive TB, where drug regimens are usually 6-9 months in duration) if not longer, and where treatment failure rates are far higher.